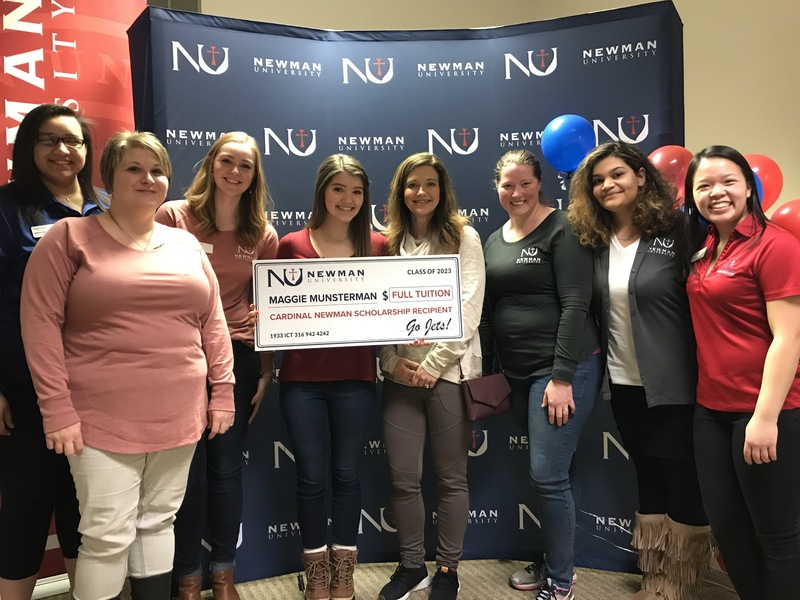 SCA senior Maggie Munsterman, pictured with her mother Joy Munsterman and members of the Newman University admissions team, was recently awarded with Newman University’s most exclusive scholarship- the Cardinal Newman Scholarship. (Lee’s Summit) – Summit Christian Academy (SCA) is pleased to announce that senior Maggie Munsterman was one of five high school seniors recently awarded the Cardinal Newman Scholarship- Newman University’s highest and most prestigious financial award. Covering four years of tuition at the university, recipients of the Cardinal Newman Scholarship must have at least a 3.9 cumulative high school GPA and a 29 composite ACT score. Following an online application and essay, twenty-three candidates were invited to campus to interview with a selection committee for the award. Maggie holds an outstanding academic record while being heavily involved in extracurricular activities, work, community service, and civic engagement. She is active at SCA as a student council member, writer’s fellow, cheerleader, student ambassador, and Bible study leader. Maggie has achieved honors from the National Honors Society and National Society of High School Scholars, and is active in her church’s youth ministry. She plans to major in business at Newman University. The scholarship is renewable for four years and is the most exclusive scholarship the university awards.